In a whirlwind of historic firsts, Shirley Chisholm became the first black woman elected to the U.S. Congress in 1968 and, in 1972, the first black candidate for a major party’s nomination for President of the United States. Join us for a screening of the Peabody Award winning documentary, Chisholm ’72: Unbought & Unbossed (2004, 75 min), which tells the extraordinary story of a woman claiming her place in American politics. 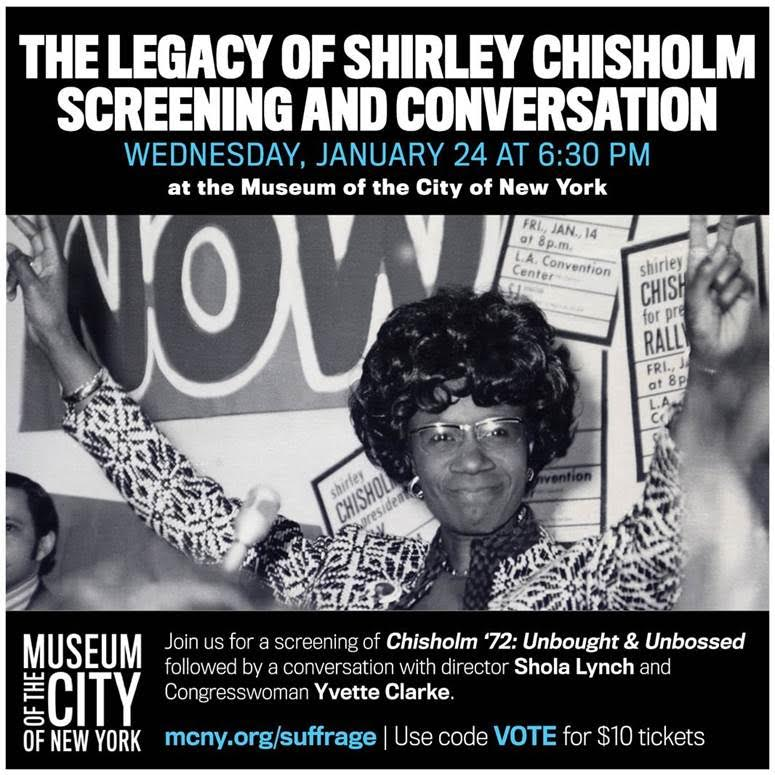 Following the film, director Shola Lynch will discuss Chisholm’s lasting legacy with Brooklyn Congresswoman Yvette Clarke, the current representative of Chisholm’s former Ninth Congressional District. Doors open to Ronay Menschel Hall at 6:00 pm and wine and light snacks will be served leading up to the program, which begins at 6:30 pm. Register online at mcny.org/suffrage | Use the code VOTE for discounted tickets! National Federation of Business and Professional Women’s Clubs is a proud sponsor of this event.